Are you looking to assess your language level in order to secure a new job, validate your university degree or integrate a higher education institution? We are a certified TOEIC® BULATS®, LILATE® and BRIGHT LANGUAGE® test centre. Prepare for the exam with our specialist trainers and then sit it on our premises. 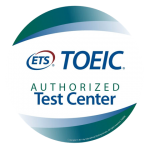 The TOEIC® (Test of English for International Communication) sets the standard when it comes to certifying your English skills. If you are a student, you may be asked to provide a TOEIC® score in order to validate your qualifications or integrate your chosen university or higher education institution. In the workplace, validating a high TOEIC® score may help you obtain a promotion or stand out from other candidates in job interviews. It also represents added value for those entering the job market. Obtaining a high TOEIC® score enables you to maximise your chances of career development, validate your qualification or obtain a job or internship abroad. In order to maximise your score, it is important to take the time to prepare for the TOEIC® exam. Our TOEIC® specialist trainers, can support you with an intensive training course over one or two weeks. Our objective is to help you obtain 800 points in the TOEIC® exam. Following this intensive training will help you improve your spoken and written English, anticipate the difficulties of the exam and avoid the pitfalls. We are a certified TOEIC® test centre. After your training, you can take the test at our premises. The results will be sent to you within 2 weeks in the form of a certificate issued by ETS, or within 72 hours if you opt for express correction. To find out more about our TOEIC® preparation sessions or to register, contact us now. The TOEIC Bridge® is an exam aimed more at people (students or professionals) with a beginner level in English. Shorter than the TOEIC®, it is favoured by trainees who simply want to find out their level in English or validate a training course leading to a qualification. The BULATS® is an international test of business English, created by the University of Cambridge. It aims to assess and certify your level in English, whether you are working, a job seeker or student. The test is based on the simulation of typical workplace situations in order to validate your knowledge of business vocabulary and expressions. It reflects not only your capacity to work in English but also testifies to your overall English level. A successful BULATS® test will boost your employability or help you to stand out from other candidates or other students. The BULATS® Listening & Reading test consists of multiple-choice and open-ended questions to assess your oral and written English comprehension. To find out more about our language training or to register for the BULATS® test, contact us now. The LILATE® (Live Language Test) platform enables you to assess your level after your language training (English, French, Spanish, German, Italian, Russian, Portuguese …). The LILATE® takes place by Skype, lasts 30 minutes and assesses the 5 language skills: written and listening comprehension, written and spoken expression and grammar. The test takes the form of a live discussion with an auditor, rather than a list of computer-generated questions. The results are sent to you within 48 hours by email. To find out more about our language training or to register for the LILATE® test, contact us now. English, French, Spanish, Italian, German, Portuguese, Russian, Chinese, Dutch … For optimal accessibility, the interface is translated into 14 languages. You can thereby consult the results and instructions in your native language if necessary. The test is performed on a computer, lasts around 1 hour and assesses Grammar and Spoken Comprehension skills. It is quite a difficult test, focusing primarily on grammar and is aimed at those with a level B1 or higher. There is also a BRIGHT® Level A English test for beginners (A1-A2). To find out more about our language training or to register for the BRIGHT® test, contact us now.